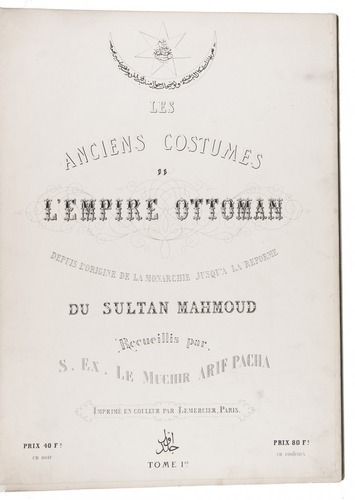 Les Anciens Costumes de l'Empire Ottoman, depuis l'origine de la monarchie jusqu'a la reforme du Sultan Mahmoud ... Tome 1er [all published]. Paris, Lemercier, 1863. Folio (54.8 x 40 cm). With lithographic portrait of Arif Pacha, drawn on stone by M. Julien, printed on India paper, with caption and imprint lithographed directly on the leaf, 16 tinted lithographic plates after Arif Pacha (image size 24.5 x 34 cm), coloured and finished by hand. Modern cloth. 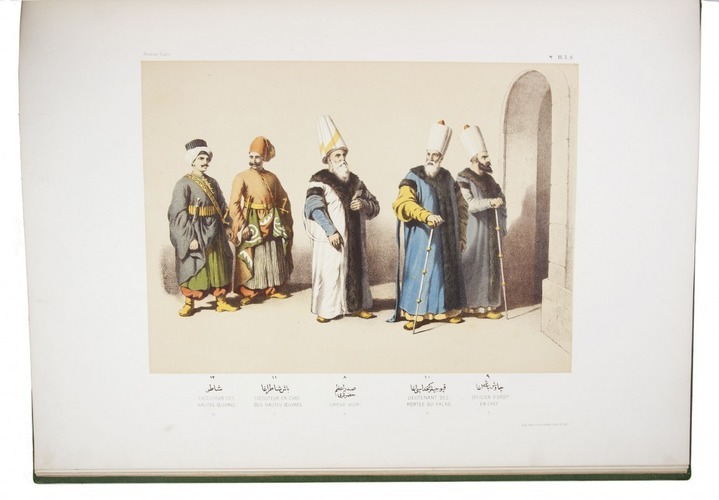 A valuable and beautifully-illustrated survey of the costumes worn at the court of the Ottoman Empire. 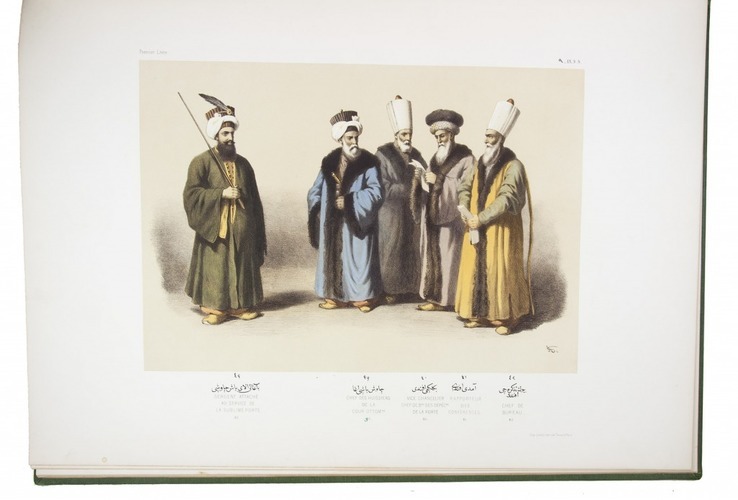 It portrays 80 forms of costume worn by Ottoman functionaries and was published in two issues, the present with the text in French and another with the text in Turkish. Although each plate is labelled "Tome 1er", no further volume was published in either language. It was available either with with tinted plates (40 Francs), or (as here) with the plates printed in colour and finished by hand (80 Francs). Arif Pacha fought against the Greeks at Athens and at Euboea (1826-1828), and in Syria against Mehmet Ali. In the course of his career carried out missions for the Sultan, who appointed him governor of the province of Silistria in 1861. Light marginal soiling, a few closed tears, corner of portrait torn off, otherwise in good condition. A complete copy of the rare coloured issue. Atabey 30; Blackmer 43; Colas 148; Lipperheide 1440m.